Young and inexperienced art collectors who are making their first steps into the high-end art market usually think that pieces made by world’s famous artists are reserved for those with much deeper pockets than their own. However, this is not true. If you are a young collector and have a limited budget for art purchases, you shouldn’t be discouraged. In the oeuvre of each artist, no matter how praised he/she is, there are always some pieces you can obtain for more than affordable prices, and all you have to do is to follow the auctions regularly. To illustrate the idea, we are taking a look into the selection of Futura’s pieces sold at auctions under $10 000 in the past two years. Lenny McGurr whom you know better by his moniker Futura 2000, or only Futura since we’ve entered the new millennium, is one of the legends in the street and urban art world. 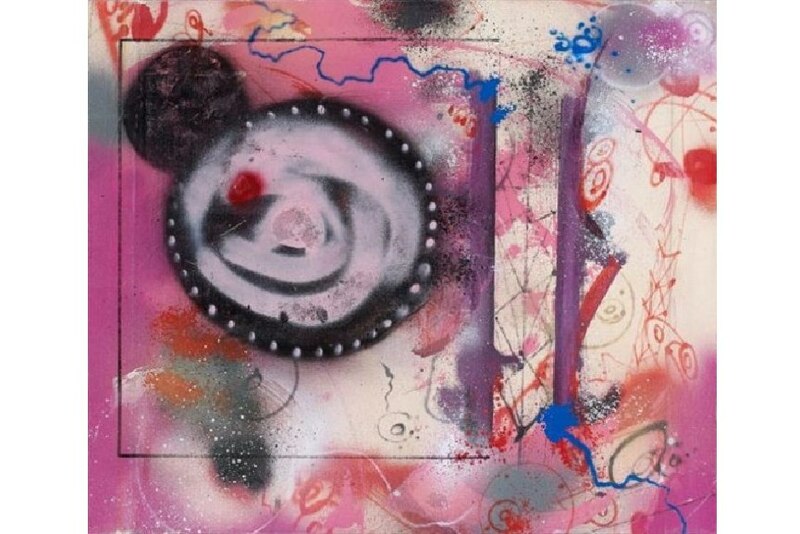 He was among the pioneering New York graffiti artists in the early eighties and his fame continues to grow still. 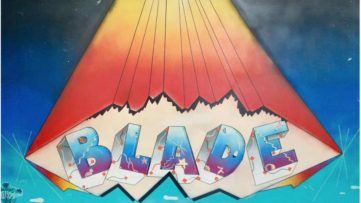 Unlike his peers who were at the time obsessed with lettering, he introduced abstraction to the world of street art, influencing generations of younger artists. 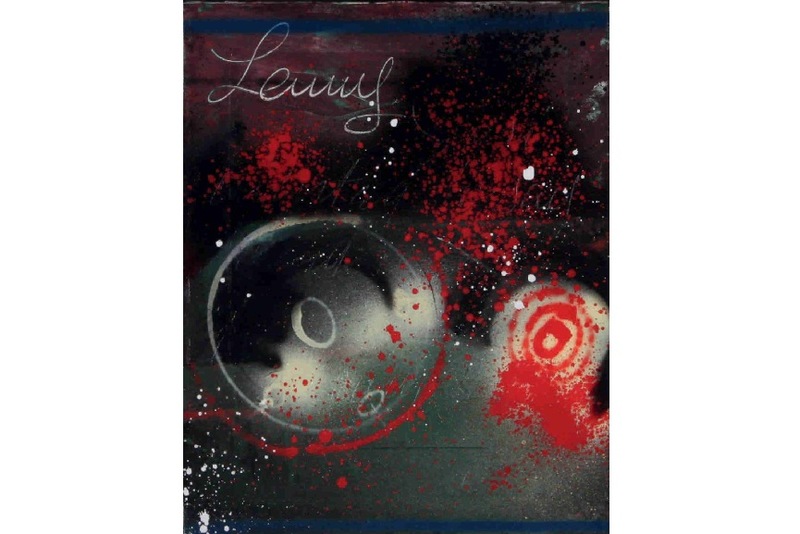 His unique approach placed him at the very top of the New York art scene, and his works were exhibited along with those of Keith Haring and Jean-Michel Basquiat. 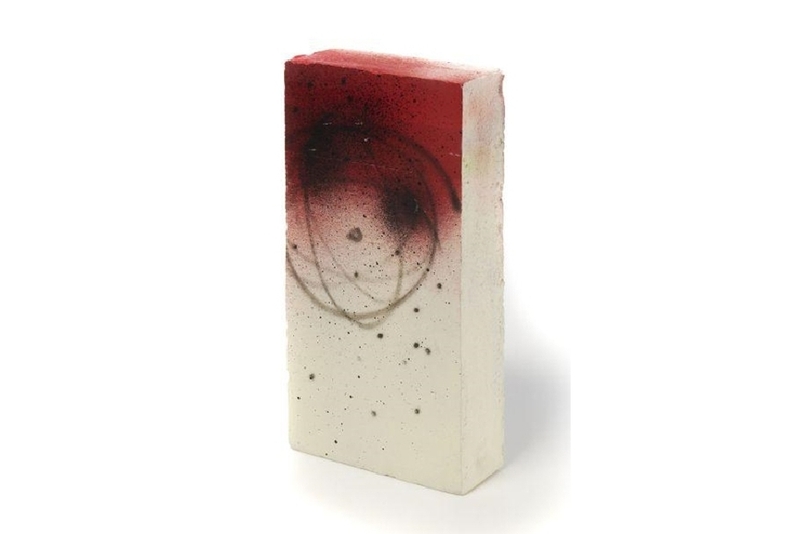 To be sure, Futura’s pieces sold at auctions never reached the jaw-dropping amounts like Basquiat’s, but some of them tend to be pricey. However, we are not focusing on those expensive works today as we tend to show how works by legendary artists can be accessible to those who are not able or not willing to spare more than $10 000. 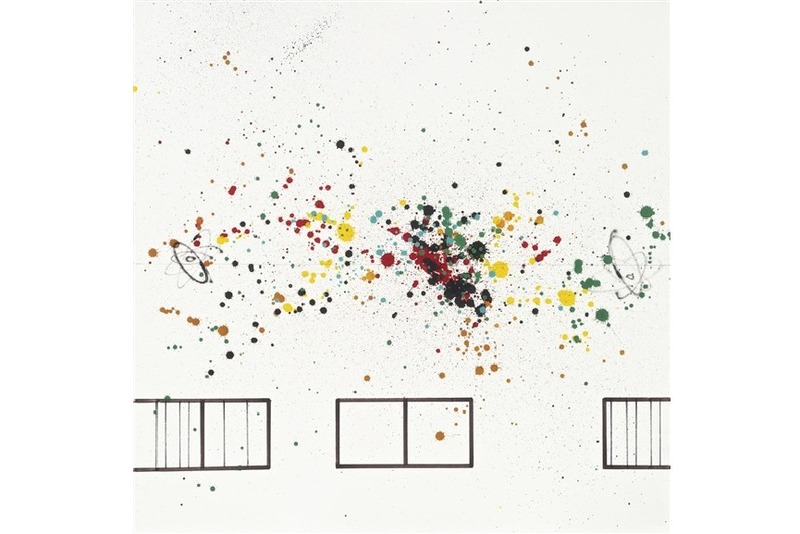 You can definitely check out other artworks and the complete data on Futura’s auctioned works here. 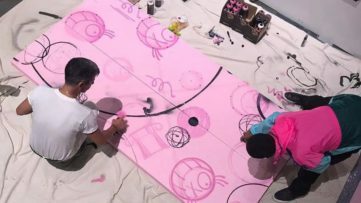 Although Futura is widely known for his graffiti practice and spray-painted works on canvas, in recent times he was actively exploring the possibilities of other artistic mediums from sculpture to clothing design and collectible toys. 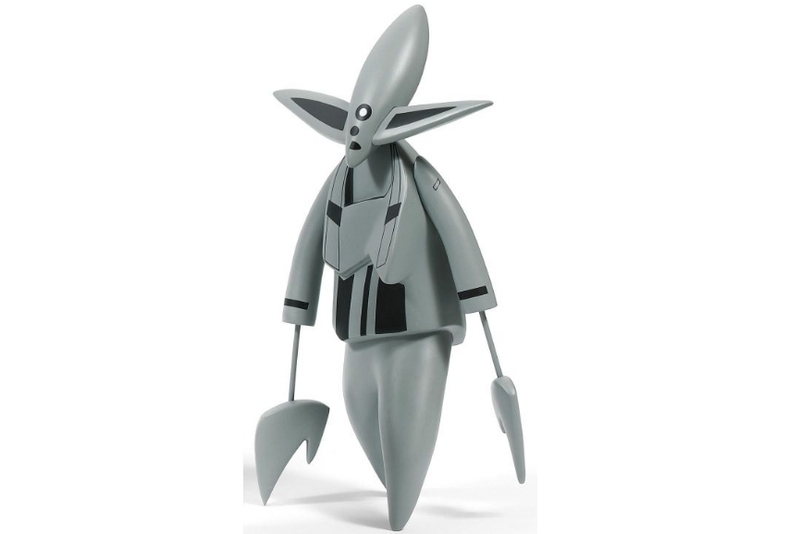 Along with his recognizable Pointman, he also created a futuristic Nosferatu character that became one of his most popular toy designs. This Nosferatu piece from 2005 was sold at Artcurial (Briest, Poulain, F. Tajan) auction house in Paris for $599. Discover more details about this piece! The second piece on the list is Futura’s Work from 2011. 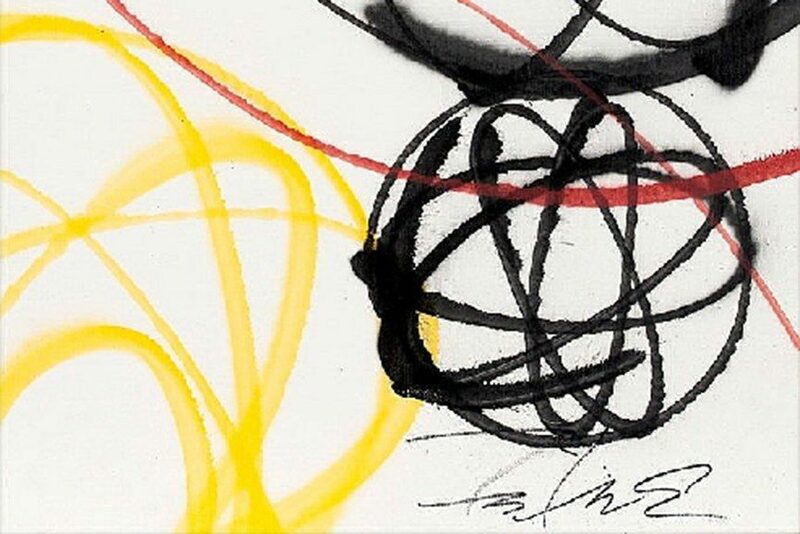 Done in the limited color palette, featuring only black, red and yellow, this painting holds a strong connection to the artist’s graffiti background. 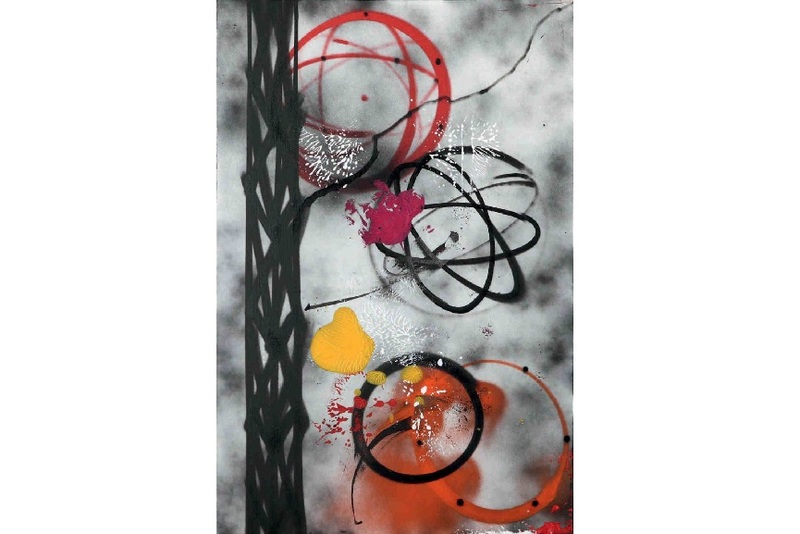 It is executed in spray paint on canvas and it features a signature atom pattern that appeared on many of Futura’s pieces over the years. This painting was sold for $1,830 in 2014 at Mallet Japan auction house in Tokyo, 23% above the high estimate. Check out the complete data on the artwork here! And there it is again. Famous atomic design, this time, in three-dimensional form. The origin story for Futura’s atoms is a rather interesting one. As the artist once stated, the inspiration for the atomic pattern came from a logo design featured on Johnson & Johnson product called Future Floor Wax. The artist saw this logo as a teenager in a supermarket and was fascinated by it. Later on, he started to explore the aesthetic potential of this pattern, turning it into the true work of art. The Atomic sculpture was sold for $2,890 at Artcurial (Briest, Poulain, F. Tajan) auction house in Paris, way above its high estimate. See details about the piece here! 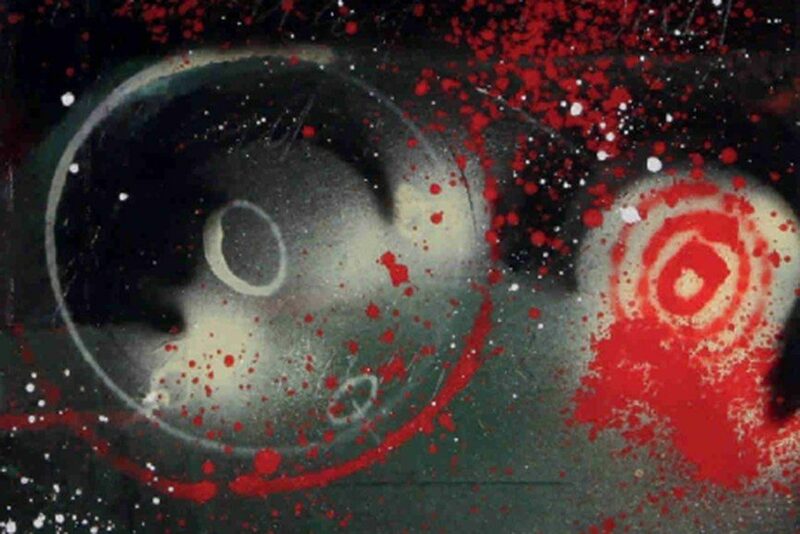 Our next piece is Futura’s work from the days when he was still known as Futura 2000. The painting Sans Titre (Untitled), No.9 is an interesting example of the artist’s early studio works. 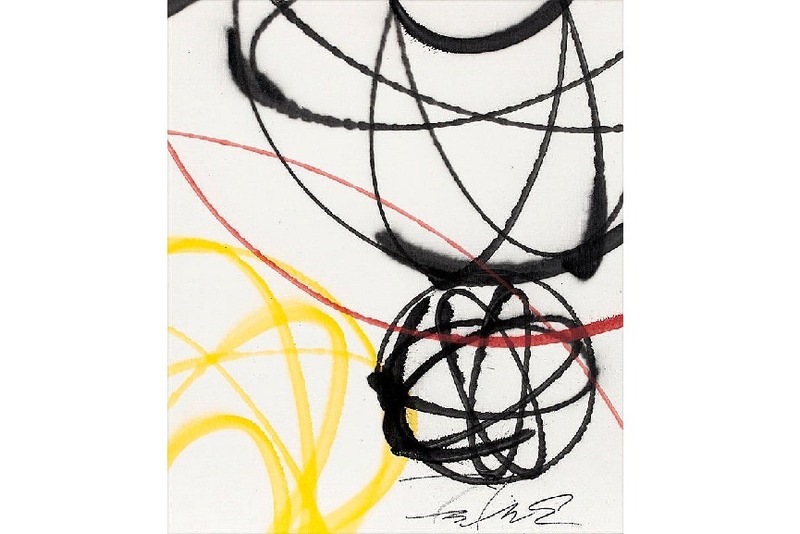 The piece features abstract shapes and spray paint equivalents to drip painting, and it is easy to see why back in the days Futura was compared to the masters of abstraction and action painters like Jackson Pollock. This piece was auctioned twice in the past, and although it failed to sell the first time, it was sold last year at Digard Paris for $5,670. Check out the trend analysis and history of this piece at auctions! Just as the title suggests, this piece brings a true outburst of creativity. Colors and shapes melt into each other, creating a fascinating composition. 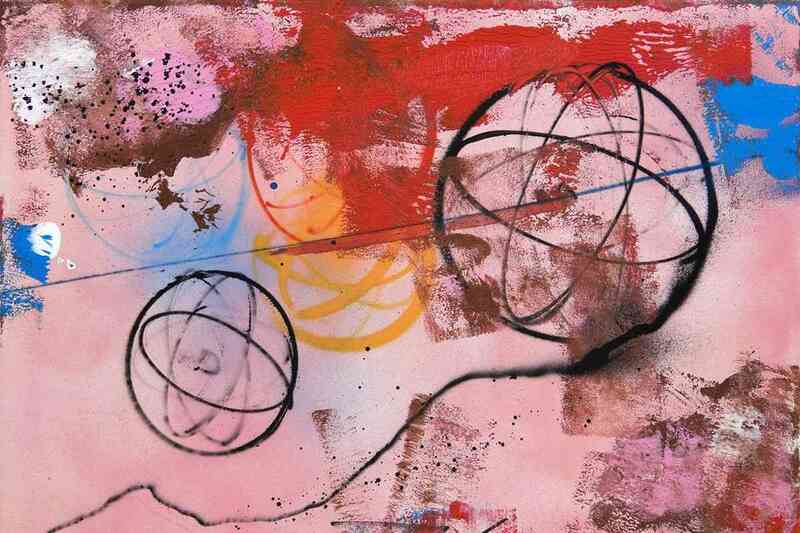 The spontaneity of graffiti and lyrical abstraction are here brought together with astonishing results. 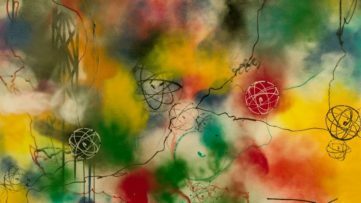 The painting titled The Outburst was created in 1989 and it appeared at the Artcurial (Briest, Poulain, F. Tajan) auction in 2014. The piece achieved a hammer price of $6,760. Check out the estimates and artwork details here! We are taking a rest from Futura’s paintings for a while and looking at an interesting three-dimensional piece. A plastic mannequin dressed in abstract graffiti appears as a novelty in Futura’s oeuvre, but it doesn’t come as a surprise considering that the artist at one point of his career started producing more sculptural works and toy collectibles. The untitled mannequin appeared at the auctions twice, each time achieving a hammer price above the high estimate. This year it sold for $4,180 at Artcurial (Briest, Poulain, F. Tajan) in Paris. Read more about the auction results for this artwork here! Futura created this beautiful triptych in 1993. In a way, it seems like the artist was exploring the metamorphosis of his beloved atom. With slightest variations in colors and shades, the central circular shape moves across the yellow surface interacting with the simpler atomic forms around it. 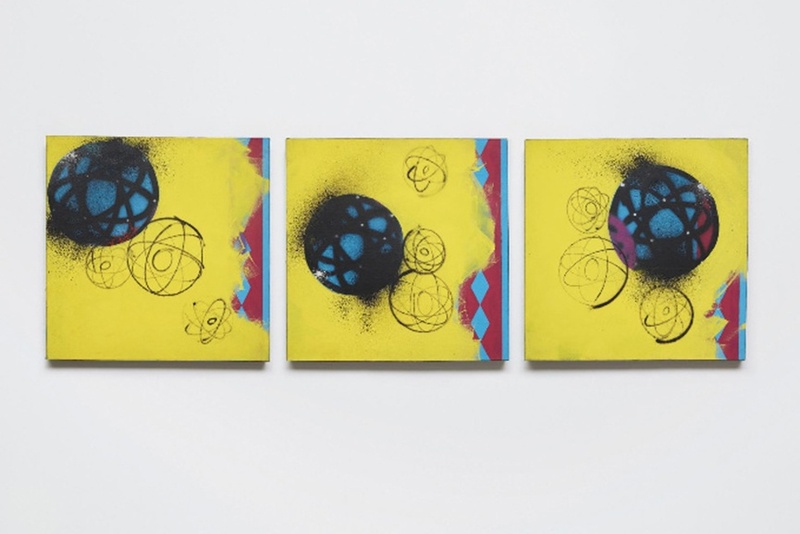 The Untitled triptych was put on sale by Phillips, De Pury & Luxembourg in New York in September, 2014 and it reached a hammer price of $7,000. Check out the estimates and details! 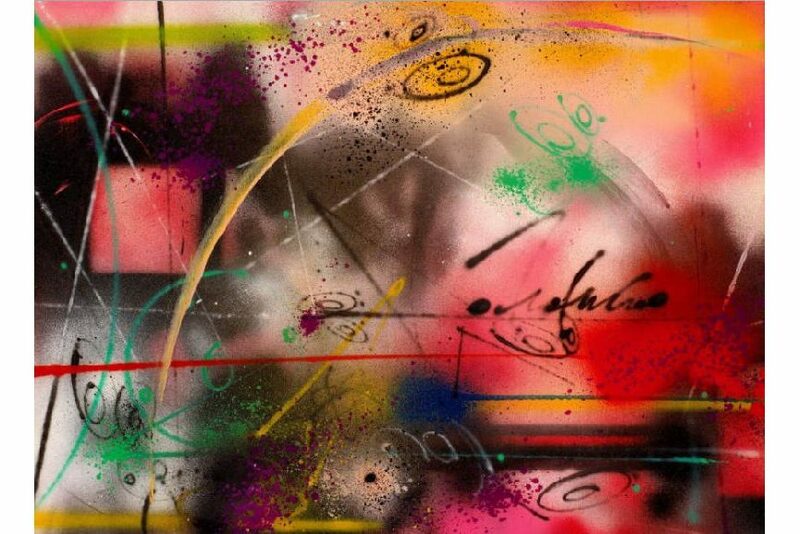 The painting entitled 10 Color Recepie Exclusilly for Roy Chau… is another of Futura’s pieces created in the 1980’s. The purposely-misspelled words in the title do make us wonder what the artist was trying to say and is there a hidden message behind the surface. Rich in colors and executed with striking virtuosity this piece is a true celebration of artistic freedom. The piece was first sold at Artcurial (Briest, Poulain, F. Tajan) Paris in 2010 for $6,900 and then again in 2014 at the same auction house for $8,790. Visit the artwork page if you want to see complete auction analysis! A more recent artwork titled Nacho shows how condensed Futura’s paintings became later in his career. The colors are limited, but a special attention is given to the arrangement of the shapes and lines. The artwork features all signature elements, from the atomic patterns we discussed earlier to the motif of a helix. The painting was sold in 2014 at Digard Paris achieving a hammer price of $8,850, 18% above the low estimate. Read more about Nacho here! The painting Bathing Five No.1 is a simple yet powerful composition. It combines the aesthetics of many influential movements from the past from Suprematism-inspired simple squares at the bottom to free-spirited abstract Pointillism and drip painting. The painting was estimated between $5,160 and $7,730 at the Sotheby’s Hong Kong auction in October, 2014. Exceeding the high estimate by 25% Bathing Five No.1 was sold for $9,670. Click here to check out the details on Bathing Five No.1!